The performance of the diversified assets are highly correlated to the performance of the Dow. Their results spiral around the trend line of the Dow and after a period of time, all the variations around the trend line average out to zero. Thus, average performance of the Diversified Portfolio will be no better than that of the Dow (or VTI) alone. Look at the correlation between different fund styles in the T Rowe Price stable of funds. 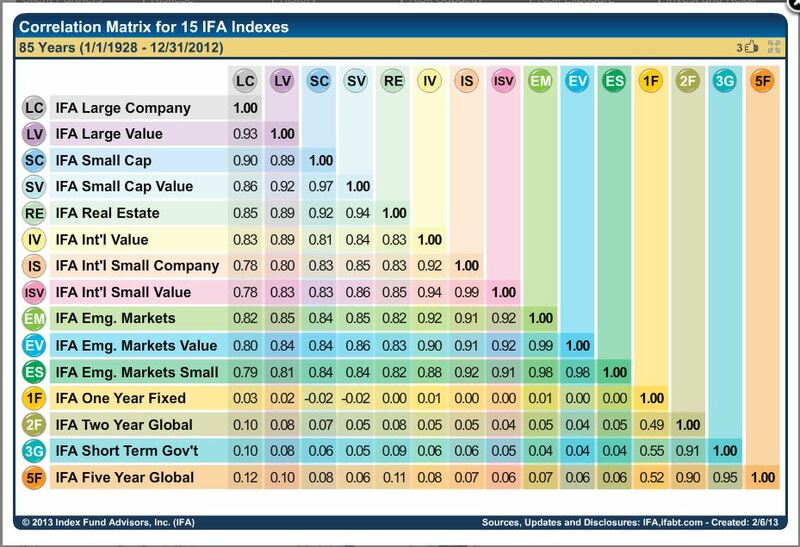 The above table shows that the performances of different asset classes as represented by T. Rowe Price mutual funds, are highly correlated to one another. The T.Rowe Price fund that comes closest to DIA is the first fund on the list, “Blue Chip Growth”. All of the other funds are highly correlated (>= .91) to this fund. The point is, these assets will move in tandem – there is little to differentiate their performance. T Rowe Price appears to be an extreme albeit realistic example. Let’s look at another correlation matrix. Not as much correlation as T Rowe Price, but still, except for the fixed Income Funds, all styles are still highly correlated. Their average deviations around the mean performance of “LC” (the equivalent of DIA), is likely to be random and small and converging on the mean of LC.